It is time to say a BIG thank you to all the people who support keeping Upton Farm green. To those who have signed the on-line petition; who have bought the “Save Upton Farm” license plates; who have written comments on our website and sent letters to the media; and who have spread the message by word of mouth and all other means, THANK YOU. As well, a big THANK YOU to our decision-makers who have caught the vision and voted their support. But dear friends, THERE IS MORE TO BE DONE, STAY WITH US, WE NEED YOU FOR THE NEXT STEP. With the unanimous support of City Council and the Provincial Legislature, the NEXT STEP is to convince the Federal Government and Canada Lands to share the same vision and RELEASE the land. To that end, we ask everyone to please e-mail a short note to each of the people below, urging them to take an active role in making this an immediate reality. PLEASE keep the comments and pictures coming; buy a “Save Upton Farm” license plate and sign the petition, if you have not done so already. Let’s stay the course together! 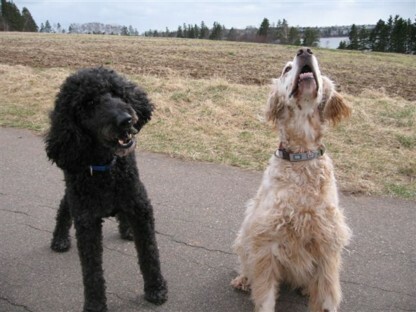 Riley (left) and Chester at Upton Farm. This entry was posted on May 14, 2007 at 5:14 pm and is filed under Pictures, Raising Awareness, You can help. You can follow any responses to this entry through the RSS 2.0 feed. You can leave a response, or trackback from your own site.